The Robinsons Royale greenhouse is our most popular Robinsons greenhouse and is displayed at most of our display centres. The double doors give a 4ft (1200mm) wide opening and are a particularly useful feature of this model - they slide easily, are lockable, and provide easy access over the ground level threshold - ideal for wheelbarrows and wheelchairs. All models are available in plain mill aluminium finish, powder coated green or white. 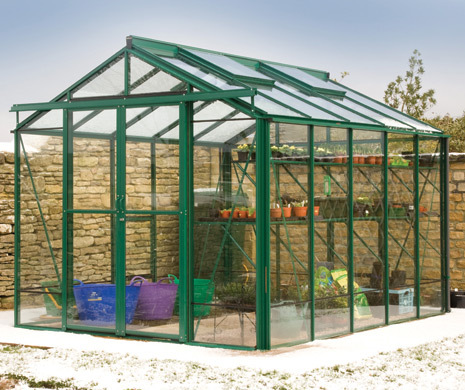 At a full 8ft 6in (2584mm) wide, the Robinsons Royale greenhouse allows you to have a full run of staging down each side and still have a 4ft wide pathway. 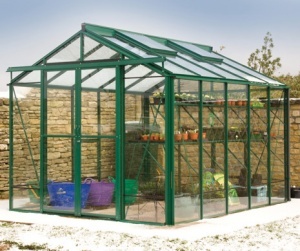 The Royale greenhouse is available in a variety of lengths from 6ft 7in (2012mm) to 12ft 8in (3872mm). You can also add an 8ft 1in extension (2480mm) to increase the length of your greenhouse. We always recommend you go for the longest model you can accommodate - you can never have too much growing space! Our image gallery will show you examples of how the Robinsons Royale greenhouse can be configured. You will see some optional extras shown, including staging, shelving, and louvre windows.